Originally built in 1888 and designed by Campbell, Douglas and Sellars architects, this former hospital, named after Queen Victoria, is located at the heart of the south side of Glasgow. This exciting new development will breathe new life into the site and with it, will bring over 400 new homes to the area. Key historic features of the site will be preserved and reinvigorated to take centre stage of this iconic new development. The development will carefully blend the restored Nightingale wings with thoughtfully designed new build aspects to compliment the site’s heritage. With a variety of purchasing options available these properties will be ideal for anyone looking to create a home in this vibrant area of South Glasgow. The Victoria is located in Langside, which is at the heart of the south side of Glasgow. Being less than 4 miles from the city centre puts The Victoria in an enviable location, with excellent local train and bus connections providing quick and regular access to the city. The surrounding roads around The Victoria are home to many local amenities including coffee shops, convenience food stores, boutique retail, restaurants and bars. With such a diverse set of amenities, it is not hard to see why this part of South Glasgow is such an attractive place for house hunters. Other key neighbours include The New Victoria Hospital, Glasgow and Clyde College and Queen’s Park. The north-west boundary of the development enjoys extensive views over Queen’s Park, which also provides an excellent range of recreational facilities, such as nature trails, a boating pond, tennis courts and all-weather football pitches. For those wanting to venture further afield, Loch Lomond and the Trossachs National Park is less than 45 minutes’ drive from Glasgow and offers breath-taking scenery and a variety of outdoor activities. For families, there are also several highly regarded public and private schools as well as nurseries within walking distance of The Victoria. For commuters, the south side of the development offers great connections to the city, with Mount Florida railway station only a short walk away. Both Glasgow Central and Queen Street rail stations provide links to Edinburgh and the wider UK rail network. Alternatively, the nearby M77, M8 and M74 motorway networks link Glasgow to the wider Scottish Central Belt. Glasgow Airport is also only 10 miles away from the city. For more information and to express your interest in The Victoria, please register your details by using one of the links below. Beech Grove Homes deliver thoughtfully designed, carefully crafted and meticulously finished homes throughout England and Scotland. Our team understands that buying a house is much more than just the bricks and mortar. 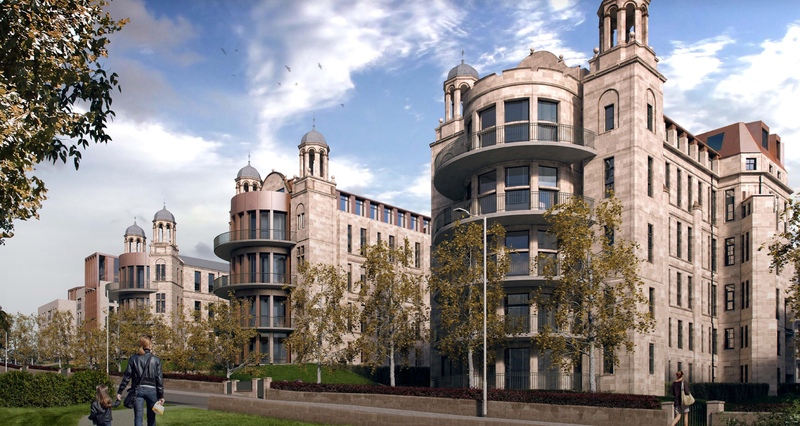 To find out more about the properties being developed at The Victoria, click below. Buying a new home is both exciting and daunting, especially if you are a first time buyer purchasing your first home. Thankfully, our experienced and friendly property experts are on hand to help find your dream new build home that ticks all your boxes. To find out more about our properties that will be available at The Victoria, from renting opportunities to New Supply Shared Equity (NSSE) purchasing options, click below. The Victoria Hospital first opened its doors in the late 19th century, with the earliest building (which is now listed) located on Langside Road. In 1893, new wards opened which doubled the number of beds and the Nurses Home was extended in 1900 and 1905 to cope with the extra demand. In 1902, management decided to build a new ward block, due to long waiting lists. This opened in 1906 with expansion continuing through to the 1930s, when the final wing on Battlefield Road was constructed. After further expansions and developments were made throughout the 50s, 60s and 70s, it caused the site to have a confusing layout, which led to the decision to close the hospital and rebuild across the road.